Wynants lives in the house with his wife, Hilde Louwagie, and their three children. His own circular seating design, Kosmos, is in the kitchen. An open-air terrace off the kitchen features a Marina table and Captain chairs from Extremis. “It’s usable when the weather is not perfect, so we use this area most often,” Wynants says. Discreet kitchen storage, which conceals the refrigerator, a wine cooler, the freezer, recycling, and cleaning materials, complements a view of one of the family’s five horses. In one part of the landscape, Wynants placed a Sunball, a circa-1968 piece by Günter Ferdinand Ris and Herbert Selldorf. Atop the carport is a Hopper table and shade by Extremis. 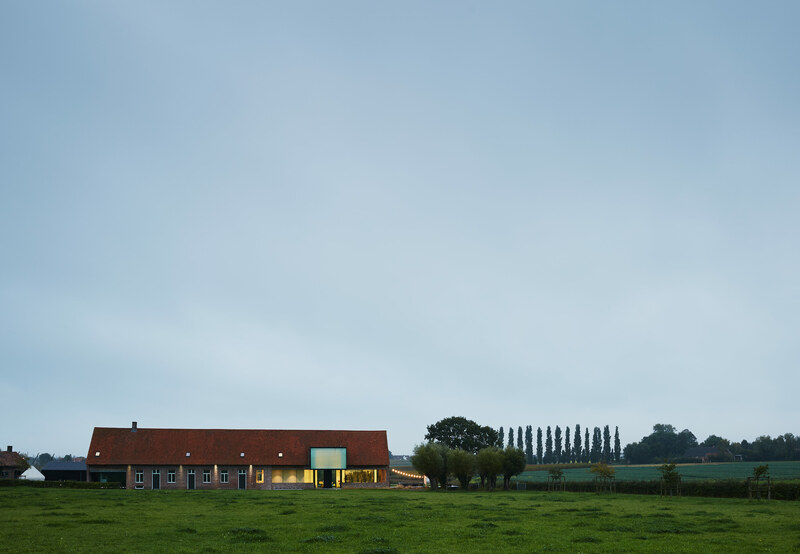 In 2006, Dirk Wynants, owner of the outdoor furniture company Extremis, purchased a circa-1850s farmhouse in Poperinge, a municipality in the Flanders region of Belgium. He spent the next seven years updating it, while staying within the area’s stringent preservation codes. Here, he shares the backstory on the project. What were you looking for in a family home, back in 2006? Dirk Wynants: We were living in a small village: 300 people and 6,000 pigs (I’m serious). Our company, Extremis, was based there due to the cheap industrial building we rented, and as long as the children were really young, it was interesting to live just across the street from work. We had all the downsides of living in a small village, but without the views, the privacy, or the quietness. We wanted to find a place with a lot of land for our horses, but which wasn’t far away from a city center—a place where we had everything we needed: a train station, schools, shops, restaurants, a library, sports accommodations, a swimming pool. Now we have all that, in the middle of the countryside but not more than two miles away from the center of this little city. We looked for something like this in all directions, also closer to the seaside. But now we have the advantage of living very close to a big part of my wife’s family as well. The location was perfect, the views fantastic, and the building had not been mismanaged by earlier renovation attempts. Your renovation of the property took nearly seven years. Did you live in the house during the process? Wynants: The stables were ready before I started renovating the farm, so the horses moved first. For our three children we brought in three old caravans, and put them in a U-shape, with a big artificial grass carpet in the middle, and a big old sofa and a television set. We would watch the news with the horses. It was a test to see if we could manage taking a step back from our luxurious lives, and we succeeded! It was a time never to forget. You’ve said you adapted the whole house for Belgium’s strict regulations. What did this entail? Wynants: The rules are most strict in the Flemish part of Belgium: the maximum ‘living space’ a private building can have here is about 35,300 cubic feet. If you want more space, you have to find a bigger building and renovate, but the maximum size to use as living space in that building still is the same. As our building is more than 70,600 cubic feet, we had to be clever in how we used the spaces that we could not use under the name of ‘living space’ and still use the building’s full potential. A bit over 1,000 square feet can be occupied for office purposes, if you have an independent activity. Four guest rooms for renting to tourists can be included in the existing structure—with no volume restrictions. A terrace under a roof doesn’t count. And then you can use areas as technical space: my prototyping room in the basement cannot be reached directly from outside, for instance. A pair of boxes cantilever from two sides of the structure. What structural and historical sensitivities informed these elements? Wynants: If you want to respect the old, the contrast with the interventions should be brutal. I want it to be very clear what is old and what is new. Inside the volume, we have the kitchen with a small informal dining area. It felt strange to me to put a kitchen in this old building, certainly in the place where the barn was situated. The technology of a modern kitchen could not have a bigger contrast with the old functions. A modern kitchen almost reaches the level of artificial intelligence: Do you know that our stove and fridge are connected to the Internet?! Crazy. In my favorite movie, 2001: A Space Odyssey, there is a black volume that represents a sort of artificial intelligence. This volume came out of space and drilled itself right through our farm. By doing that, one side peeled off and glass became visible. Normally, you are not allowed to extend the existing volume, but they allowed it. There were two non-original side buildings that we took away, and those had the exact volumes of the extensions we added. Also, I told them, ‘If you allow us to do this, we will not touch the rest of the roof.’ They understood this was crucial, and I got the permission. I’ve had to explain this many times to people whose building permits were refused and who didn’t understand why I got permission. A lot of modern architecture here has glass all around, making the house completely transparent. I would love that if we had a better climate, but in Belgium we have a lot of gray, rainy days, and sometimes I prefer to escape from that by hiding in the safety of the old closed roof—cozy and warm, away from the harsh elements. We can sit in the glass bulb—where it feels like we are really outside, no matter how windy or cold it is, to enjoy the landscape. You worked with Govaert & Vanhoutte Architects, but you were involved in the overall design. Wynants: I am an interior architect. That is a real architect, except that I’m not allowed to do the structural work. However, I teach product development, not interior architecture. In my opinion, a good furniture designer is something in-between. You teach design at the Shanghai Institute of Visual Arts (SIVA) and you also have a design studio there. Do you enjoy teaching? Wynants: Building the curriculum is the biggest challenge—how can you teach creativity to people who are not trained to think for themselves? Most important is not to skip steps: creativity first, then technical and practical skills. You installed solar panels, which produce enough energy for a geothermal system. As a result, your house is completely fossil fuel–free. Was this a goal from the beginning? Wynants: I feel guilty about my footprint. Therefore, I want to minimize my impact wherever I can, and keep the maximum quality at the same time.I have a huge house, but we don’t use fossil fuel. I put many products on the market, and I earn a good living with them, but I make them as sustainable as I can. I drive a fast and beautiful car, but it’s fully electric, and the new factory we’ve built is ready to become fossil- fuel–free as well. If those who can afford it don’t do it, who will? Now that the renovation is complete, would you do it again? Wynants: It was a very intensive process, and not that easy to combine with all my other activities. I must admit that at certain points I doubted if I would make it to the end—it took so much energy. On the other hand, I need these kinds of projects and challenges; I can’t escape from them. My worst periods are when an important project is brought to a good, successful end, and I can only help myself by starting another one. But still I consider myself a lazy person, who only wants to enjoy life.